Oscar overhaul? Is a major overhaul of Oscar's best picture race in the works? The buzz in Hollywood is that it's a topicfor consideration at the Motion Picture Academy's board of governors meeting scheduled for Mar. 24. While no immediate action is likely, insiders anticipate that the issue will continue to get serious attention in the coming months. It's no secret that the Academy failed in its efforts to broaden the field of best picture nominees to include mainstream boxoffice hits that people across the country have actually bought tickets to and might like to see win. In 2009, the Academy went from many years of having five best picture nominees to now having 10, as it did for a while in the 1940s. By 2011, that change was amended to allow for between five and 10 nominees, depending on how many titles received sufficientvoter support through the Academy's byzantine preferential voting system. What is believed to have prompted the Academy's 2009 change was that "The Dark Knight" didn't land a best picture nod despite its huge success. "Knight" grossed over $530 million in domestic theatres and Christopher Nolan was widely applauded for his filmmaking skills, but the picture was apparently regarded as being too commercial for best picture consideration at a time when small critically-driven specialized titlesdominated that category. The problem is that the small indie films that are celebrated at film festivals and that Academy voters feel so good about nominating, don't reach wide audiences. They do well in New York and L.A. and a handful of other big cities, but don't even play in many of the country's so-called "less sophisticated" markets. That translates into little or no rooting interest in who wins and that, in turn, means lower ratings for the Oscar telecast, as was the case this year. Those ratings, however, are what bring in the big advertising dollars that give the Academy most of its annual income. The average price for a 30-second spot on February's 87th Annual Academy Awardswas a record setting $1.95 million, up about 8 percent from the previous year. The show's ratings, however, fell about 16 percent, the lowest in six years. The Nielsen fast nationals showed an average of 36.6 million viewers and a 10.8 rating in the key 18-49 age demo, down 16 percent and 18 percent, respectively, from 43.7 million and 13.1 million a year earlier. That's got to be cause for concern at the Academy. Madison Avenue isn't likely to keep ponying up record setting prices for sinking ratings. So it makes sense for the Academy to take a careful look now at why the show's appeal to the television audience is lagging. The answers include too many nominated films that viewers haven't seen, don't care about and must sit through clips from all of them. Only one of this year's eight best picture nominees ("American Sniper") was a solid boxoffice hit that was playing in very wide national release. Another criticism being heard about this year's telecast is that it featured so many musicalsegments that the Oscars could easily have been mistaken for the Grammys! Insiders anticipate a change in the show's producing team, which has emphasized musical numbers for the past three years. The producers, however, can't be blamed for which films actually get into the best picture race. The Academy, itself, is at fault there for having constructed a system that doesn't give its members sufficient time to see contending films before making their nominations. This problem stems from the fact that people who make movies are typically so busy making them throughout the year that they don't have time to see them. That leaves Academy members scrambling to catch up with lots of movies in late December -- just as many of them are busy packing to leave town for holiday vacations. Their nominations ballots are due soon after they return in January. It's an overwhelming problem that seems to get resolved by Oscar voters looking closely at what key critics groups have been applauding earlier in December and what is nominated for Golden Globes consideration in mid-December. Those films become the ones that get seen by Academy voters – mostly now at home via DVD screeners – and then get nominated. And those tend to be small indie dramas about important socially meaningful themes. In recent years, this critics groups-driven awards environment has had the effect of taking big mainstream movies out of the best picture Oscar race. There's no denying the fact that you can't win if you don't get nominated. And if you're not a critics groups'darling these days, it's very difficult to be nominated. A new timetable for making nominations would benefit the entire process. If the Academy defined a nominations consideration period that began in mid-November and ended in mid-December, it would start and end the nominating process well before members were leaving for winter holidays. It would also force distributors to end the logjam of films that now open in very late December – just in time to qualify for Oscar consideration while hoping to command voters' interest because they've only just arrived. Another good reason to scrap the five-to-10 best picture nominee rule is that having more than five nominees may havecheapened the value of a best picture nom. With only five noms, it's still a small club that confers elite status on the nominees. But the more noms there are, the less merry it is for all. Worse yet, having to screen clips from all those films adds time to a show that consistently runs way too long. This year's show ran about 3 hours and 40 minutes and felt even longer. Moreover, having more than five Oscar nominees for best picture means there will always be orphans in the race that are at a disadvantage because they don't also have directing or film editing nominations. That's because most other Oscar categories are limited to only five nominees. All this is bad enough, but expanding the best picture category didn't even achieve the goal of bringing to the show some big films people had seen and cared about. That's clear from a quick look at who's been nominated since the rules changed. In 2008, the year "Knight" opened, there werefive best picture nominees,none of which were wide appeal titles: "The Curious Case of Benjamin Button," "Frost/Nixon," "Milk," "The Reader" and "Slumdog Millionaire," which won. In 2009 the category was expanded to 10 noms and several titles emerged that might previously not have gotten into the race. The field included: "Avatar," "The Blind Side," "District 9," "An Education," "The Hurt Locker," which won, "Inglourious Basterds," "Precious," "A Serious Man," "Up" and "Up in the Air." "Avatar" was a boxoffice giant with about $750 million in domestic theatrical grosses, but given the critical acclaim for James Cameron's unique 3D techniques and visual creativity it would probably have had a strong shot at being nominated even in a field of five. "Air" was a major studio release (Paramount) with a big star (George Clooney) that did okay at the boxoffice ($83.3 million), but it was actually a small scale R rated romantic drama from an indie-style director (Jason Reitman). It really wasn't the kind of big commercial blockbuster the Academy had wanted to try to make room for in the best picture race. "Up," an animated family film, reflected the new spirit of including commercial films. The Disney/Pixar 3D comedy adventure, which grossed $293 million domestically, wound up winning the best animated feature Oscar. "Blind" was another good example of a title that probably would have not gotten into a field of five nominees. It was a major studio (Warner Bros.) release that did big boxoffice business ($256 million domestically), had big star power (Sandra Bullock) and was a mainstream genre (sports drama). "D9" probably benefited from there being 10 nominees. It was a commercial success ($115.6 million domestically) released through a major studio (Sony) and a genre (sci-fi) that's not usually identified with the best picture race. In 2010 there also were 10 nominees, including a few mainstream titles that probably wouldn't have made the cut in a field of five: "Black Swan," "The Fighter," "Inception" (Christopher Nolan's first and to date only best picture nod), "The Kids Are All Right," "The King's Speech," which won, "127 Hours," "The Social Network," "Toy Story 3," "True Grit" and "Winter's Bone." "Inception," "Social," TS3" and "Grit" were the likely beneficiaries of there being 10 nominees. Four commercial titles out of 10 nominees was a decent showing. But things changed in 2011 when the Academy revised the 10 nominees field to a 5-to-10 field, depending on how the nominating votes came in. 2011's nine best picture nominees were: "The Artist," which won, "The Descendants," "Extremely Loud & Incredibly Close," "The Help," "Hugo," "Midnight in Paris," "Moneyball," "The Tree of Life" and "War Horse." Of these, only "Hugo" and "Moneyball" would probably have had a shot at getting into a five nominee race. "Help" was a commercial hit ($169.7 million domestically), but its civil rights storyline would have resonated with Academy members. "Horse" was a Steven Spielberg film and almost certainly would have been on Academy voters' radar. 2012 also brought nine nominations, but most of them were not the kind of mainstream films the Academy set out to add to the best picture race: "Amour," "Argo," which won, "Beasts of the Southern Wild," "Django Unchained," "Les Miserables," "Life of Pi," "Lincoln," "Silver Linings Playbook" and "Zero Dark Thirty." The beneficiaries of having a wider arena were likely only "Argo" and "Les Mis." "Pi" was from Ang Lee and "Lincoln" was from Spielberg, both of whom would be safe bets to get noms in a field of five. There also were nine noms in 2013 and, once again, most of them were for the kind of specialized product Academy members had intended to balance with some new mainstream noms: "American Hustle," "Captain Phillips," "Dallas Buyers Club," "Gravity," "Her," "Nebraska," "Philomena," "12 Years a Slave," which won, and "The Wolf of Wall Street." Of these, "Gravity" may be the only title that would not have been there without the category's expansion, and even that isn't necessarily so. Although "Gravity" was a boxoffice hit ($274.1 million) from a major studio (Warner Bros.) and a commercial genre (sci-fi), it was unique in being a big film that felt small by having only two actors in it, one of whom dies midway through the picture. "Wolf" was from Martin Scorsese, who would almost certainly have made the grade even if the Academy had only five nominees. 2014 saw only eight best picture nods, of which only one movie may have been the kind of commercial hit the Academy set out back in '09 to try to include: "American Sniper," "Birdman," which won, "Boyhood," "The Grand Budapest Hotel," "The Imitation Game," "Selma," "The Theory of Everything" and "Whiplash." Although "Sniper" was a blockbuster ($342.4 million) from a major studio (Warner Bros) and a commercial genre (action war drama), it was from Clint Eastwood, who's won four Oscars over the years and is very much on the Academy's radar any time he makes a new film. So, arguably, by 2014 the Academy's intention of broadening the best picture race by allowing room for commercial releases that people at home had actually seen and could root for had gone out the window. A return to having only five nominees for best picture would, at least, deal with a failed policy that's only served to make the Oscar telecast longer and less audience friendly. But the Academy is known for moving slowly and being very conservative about making changes, so don't expect to see anything happen on this front for a while. Bottom line:Last weekend's boxoffice was driven by films that aren't the kind that get best picture noms now, but thatcould change if Academy members take a new approach to making nominations. "Insurgent"invaded theatres and captured first place with $54 million domestically and $47 million from 76 international markets. Lionsgate said its domestic audience was 60 percent female and 55 percent under 25. "Cinderella"was dancing in second place with $34.5 million in its second weekend, bringing its domestic cume to $122 million Disney estimated that its domestic and international ticket sales combined were $75 million with a global cume of $250 million. Between them, "Insurgent" and "Cinderella" cranked up temps at the March boxoffice. That warming trend could continue with this weekend's two wide openings. DreamWorks Animation and 20th Century Fox's 3D PG rated animated fantasy adventure "Home,"opening at about 3,600 theatres, is from the creators of "The Croods" and "How to Train Your Dragon. "It's tracking best and equally well in double digits with women under and over 25, so moms-with-kids have "Home" on their radar screen. 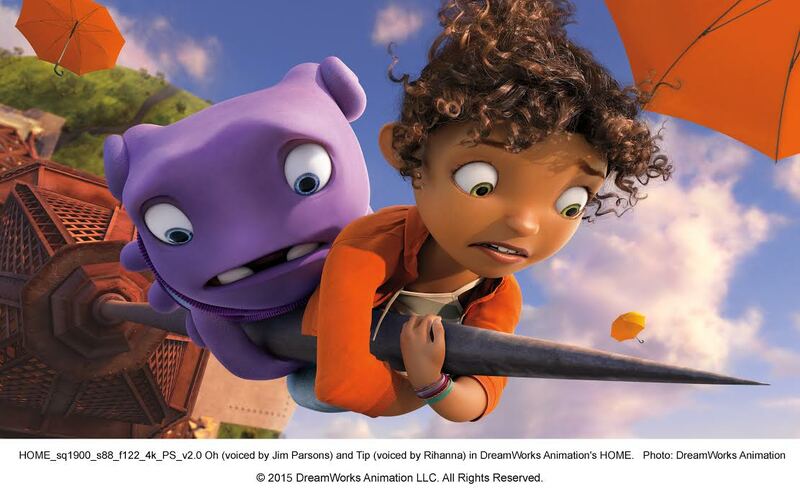 Directed by Tim Johnson ("Over the Hedge"), "Home's" voice talents include Jim Parsons, Rihanna and Steve Martin. In "Home," Boov aliens take over Earthand relocate all humans while the planet's being reorganized. The resourceful Tip (Rihanna), who avoids capture,finds herself the accidental accomplice of Oh (Parsons), a banished Boov, as they embark on the road trip of a lifetime. Also arriving Friday at about 3,149 theatres is Warner Bros. R rated comedy "Get Hard," from first time feature director Etan Cohen, starring Will Ferrell, Kevin Hart and Alison Brie. It's tracking best and in double digits with under-25 males and nearly as well with men over 25, making it great counter-programming for female appeal films like "Home," "Insurgent" and "Cinderella." In "Hard," millionaire James King (Ferrell) is convicted of fraud and being sent to San Quentin. Desperate for help on how to survive behind bars, he turns to Darnell Lewis (Hart).